Peter Bryer: Mobile Foresight: The new tiny little “nano SIM” card. Is it still infinitely too large? 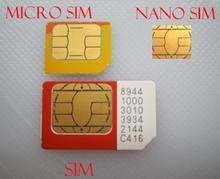 The new tiny little “nano SIM” card. Is it still infinitely too large? Is this the last SIM card you might ever own? With talk of secure virtual SIM cards as network identifiers, it would be fair to wonder how much life the physical SIM has left. I would have thought the micro SIM card which Apple a house-hold name would have been a possible last iteration. But now we have the “nano SIM” from Giesecke & Devrient. This is yet to be standardized, and apparently G&D is working to push this via ETSI’s specification-making machine. Sure, it’s smaller and could lead to some interesting form factor devices and will likely support more machine-to-machine communication, but isn’t it time to move beyond the SIM card and numbers as identifiers? It’s so 20th century. It’s time to make a big moves in the growing identity crisis. 12mm x 9mm vs Micro SIM’ is 15mm x 12mm.